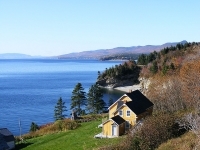 The huge province of Quebec occupies the eastern part of Canada, with coasts on the North Atlantic, Hudson, and James Bays, and the Lawrence Seaway, the major shipping channel of the east coast which cuts through the south of the province. The main cities of Montreal and Quebec City are both situated in the more populated south on the banks of the St Lawrence River. The province has a wide variety of landscapes, climatic regions, and vegetation, and therefore numerous different tourist attractions, scenic routes, and holiday getaways to offer travellers. The wilderness prevails in the most northerly reaches, with thick forests and clear lakes dominating the landscape. This then gives way to the snowy mountains of the Laurentians, popular resort country, while down south is the urban sprawl of Canada's French-speaking cities and the rolling pastures of the farmlands. Quebec has 22 national parks and a variety of stunningly beautiful natural landmarks, including Montmorency Falls outside of Quebec City and the Gaspé Peninsula on the St Lawrence River. Quebec has a uniquely French flavour, remaining the only North American region to preserve its Francophone identity. In Quebec, French is the official language and is spoken by more than 80 percent of the population. For decades the province has been dogged by political battles regarding secession, but moves to turn Quebec into a sovereign state have currently been put on the back-burner in favour of concentrating on economic development.